Age Limit: Candidates should not have born before 01-05-1983. Educational Qualification: Candidates should possess Full Time Degree in Civil Engineering with minimum 60% marks & Minimum 01 year experience in Civil Construction. Application Fee: Candidates have to pay Rs. 300/- for UR/OBC category (non creamy layer) as registration amount & examination fee by demand draft drawn in favour of IRCON International Limited , payable at New Delhi. No fee for SC/ ST/ Ex-Servicemen category candidates. How to Apply: Eligible candidates can apply online through website www.ircon.org from 16-06-2016 at 00:00 hrs to 30-06-2016 by 24:00 hrs & printout of the submitted application with pasted recent (self-attested) passport size photo & signature in the space provided along with self attested documents as given in notification, envelope must be superscribed as “Application for the post of “Works Engineer/Civil for Ircon’s CTP-12 DFC Project Mumbai/ Surat , Advt. No. – C 08/ 2016 on contract basis” to Joint General Manager/ HRM, Ircon International Limited, C-4, District Centre, Saket, New Delhi – 110017 on or before 07-07-2016. Starting Date to Apply Online: 16-06-2016 at 00:00 hrs. Last Date to Apply Online: 30-06-2016 by 24:00 hrs. Last Date for Printing & Submission of Application: 07-07-2016. Age Limit: Candidates maximum age is 45 years as on 01-06-2016. Educational Qualification: Candidates should possess Full Time Bachelor’s Degree in Electrical Engineering from recognized Institute/ University approved by AICTE with not less than 60% Marks/ equivalent grade with relevant experience. Application Fee: Candidates have to pay Rs. 500/- as registration amount & examination fee for General & OBC by demand draft drawn in favour of IRCON International Limited, payable at New Delhi/ by Online. No fee for SC/ ST/ PwD & Ex-Servicemen category candidates. How to Apply: Eligible candidates can apply online through website www.ircon.org from 25-06-2016 at 00:00 hrs to 09-07-2016 by 24:00 hrs & printout of the submitted application with pasted recent (self-attested) passport size photo & signature in the space provided along with self attested documents as given in notification, envelope must be superscribed as “Application for the post of “Deputy General Manager/Electrical – Advt. No. 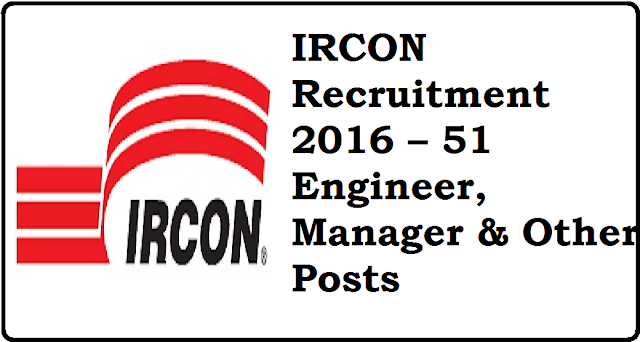 -06/ 2016 on regular basis” to Joint General Manager/ HRM, Ircon International Limited, C-4, District Centre, Saket, New Delhi – 110017 on or before 16-07-2016. Age Limit: Candidates maximum age is 33 years as on 01-04-2016. Educational Qualification: Candidates should possess Graduation in Any discipline with Proficiency in English Typing (40wpm), English Shorthand (80wpm) with relevant experience. Selection Process: Candidates will be selected based on Skill test. How to Apply: Eligible candidates may send their application in prescribed format along with relevant documents & in an envelop should be superscribed as “Application for the post of Personal Assistants on Contract Basis” reach to Joint General Manager/ HRM, IRCON International Limited, C-4, District Centre, Saket, New Delhi-110 017 on or before 07-07-2016 & walk in skill test on 11-07-2016 from 09.00 AM to 04.00 PM. Last Date for Receipt of Application 07-07-2016. Date & Time of Skill Test 11-07-2016 from 09.00 AM to 04.00 PM. Venue Joint General Manager/ HRM, IRCON International Limited, C-4, District Centre, Saket , New Delhi-110 017.